Hey everyone, I'm excited to finally reveal Samara's niche site that she has been working on for the past couple of months. Today's post is technically coaching call #11, even though we mostly just review the site for you on video and discuss why we did what we did. I'd like to briefly walk you through the journey that Samara and I have been on before I reveal the site. Samara has been working REALLY hard on this site, and these 11 coaching calls are only a glimpse of the amount of effort that has been put into the project. Samara's was voted the #1 applicant out of over 100 applicant videos. Watch the video reviewing the applicants and announcing Samara's as the chosen student here. We covered how to choose a niche and then how to do in-depth keyword research. We discussed how to develop a long term content strategy. We strategized on how to monetize the site. We discussed how to build links to your niche site. We talked about many other things in-between as well; see all the coaching calls here. Samara published the very first article on the site around March 1st (so the site is about 2 months old). I wasn't quite sure when would be appropriate to reveal the site. 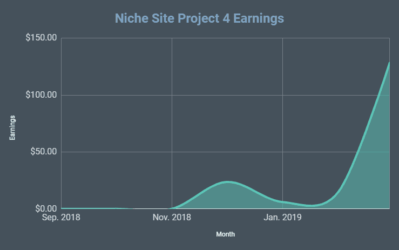 I wanted to do 2 things: First, I wanted to prove that Samara could build a niche site and start showing early signs of success without ANY involvement from the Niche Pursuits community. 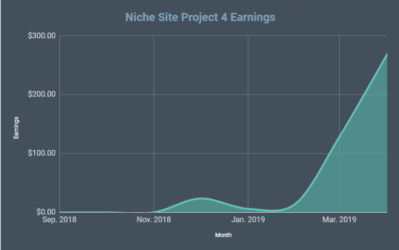 Second, I want the Niche Pursuits community to still have a great learning experience; and that often comes with being able to visit the niche site we are talking about. Most people wanted to see the site once 20 article had been published. Well, I'm happy to share that Samara's site now has just over 20 articles published and has made it's first sale! I felt like if we waited a few months until the site was making $500/mth before revealing it that people would lose interest in the project. So, I think we've struck a nice balance here, the site has over 20 articles, has made a few sales, and is getting natural search engine traffic from Google everyday. And the Niche Site Is…. So, with that introduction, it's time to reveal the niche site! The URL of Samara's site that she has been working on the past couple of months is: TinyFry.com! Feel free to go to the site and check out what has been done so far. Besides revealing the site, the big news is that it's ranking in Google and earning money! Here's a quick screenshot of the earnings. The site has earned $15.24…woohoo! Today’s the big day! We are revealing my website and I’m a big ‘ole bundle of nerves, but I’m also excited to show you guys what I’ve been working on these past few months. Welcome to Tiny Fry! As you can probably see, the website revolves around babies and kids, a niche I chose to go into mainly because I recently had a baby and this is what’s most interesting to me at the moment. I also chose it because it’s a huge market, I found weak doppelgangers, and there are lots of opportunities and areas I can branch into going forward. As I mentioned on the call, I started off focusing on toys and am now getting into crafts, gear, and games and activities. I’m trying to publish a few articles a week if I can, and I’m also constantly working on backlinks and outreach. A few people I have reached out to have shared my posts on their social media, and I’m trying to develop relationships with people in the niche, which is nice because otherwise the process is a bit lonely. And as Spencer says on the call, building a website should be a social experience. We took a look at Google Analytics, which shows that I’m getting just a few visitors to the website, and we looked at Google Search Console, and we saw that I’m starting to rank for my keywords… sometimes in 60th position, yes, but I’m ranking nonetheless. You gotta start somewhere. All in all it’s pretty exciting. We also saw how I’m ranking for keywords I’m not even targeting, which just reinforces the idea that focusing on as many long tail keywords as you can is the way to go. I’m also excited to report that I have about 10 backlinks at the moment, which isn’t a bad start (or so I’m told). As you all know, this is a work in progress and I sense I will be an eternal student of WordPress (and Spencer). Some things on my site may not work right, some of the formatting may vary between blog posts, some of the links might be wrong, but I’m working on it! The learning curve is tremendous, but after slaving away at my desk and after many a late night in front of my computer, it’s definitely starting to come together. I have definitely learned a few valuable lessons along the way, some of which I’d like to share with the hope that they might help you guys as well. I think you should spend at least some time planning the structure of your articles. I published a whole bunch and they all looked different because I didn’t really think about how they should look. Around article 20 I figured out what style I liked, and now I have to go back and make lots of changes so that the site looks uniform. This may not be important from an SEO-perspective, but you also want your site to be cohesive and aesthetically appealing. If you’re testing out writers, think about giving them one or two articles to start, and then decide if you want to send them more work. I sent all of my articles to two authors without giving it too much thought and I was pretty disappointed with the content they returned, but I was stuck. I think it’s easier to pick a niche that you’re interested in, even if it’s only a remote interest. Building a website like this is all-consuming, so it’s a good idea to actually like the topic you’re getting into. It’s easy to feel overwhelmed, as there are lots of moving parts, from keyword research to the search for backlinks. I think it’s important to get organized and try to do a little bit each day or work on something different every day (Wednesday – keyword research, Thursday – outreach…) to make sure you’re always making progress in each area. WordPress used to make me swear like a sailor, but not anymore (or, maybe more accurately, not as much). Stick with it! I never thought I’d say this but it does get easier with time (and blood, sweat and tears, but mostly time). The “big” news we shared on the call is that I earned my first dollar. Someone—who I don’t know (I’d like to emphasize that)—actually went to my site, clicked on a link and bought something. At the time we recorded the video, 2 items had been purchased, for which I earned $1.11, but now I’m thrilled to report that my earnings have skyrocketed to $15.24, since 2 more items were purchased through my affiliate links. It’s an amazing feeling and it has motivated me even more to continue to try to produce useful content. It also validates the process. I hope you’re all making progress with your own sites. For now, my long-term strategy is, as Spencer says, “more of the same”: content, social media, backlinks and outreach. Hopefully I’ll have more exciting news to report down the line, so be sure to watch this space! You can watch the full video of the call below. If you would rather just listen to the audio only, you can download it here. Hi Pauline! Thanks for your comments! I too am tired of the 1:1 time/money exchange! I’m hoping that this model provides me with a different way of earning income. I agree that NSP3 is valuable because it will (hopefully) show that people other than Spencer, and other experts in this space, can find success building niche sites. I hope you’re building a site too! I am one out of those thousands of learners who are following this NSP3 to see how we can build a genuine site that will bring value to the readers and also a consistent income for the owner. To introduce myself, I am a stay at home mum of three and have started a few projects a year ago. I am a writer as well …but being a Non Native writer I don’t think I’ll be able to earn a good income through my writing work and its hard to earn better in this field…(if you are Non Native English person). Though have learned a lot things now but still find myself disorganized and nowhere in my niche site venture. I have spent on the site and bought content from Native English writers but I never get what I want. I am skilled in dealing with WP customization and handling sites. What I need to know is that how can I start organizing myself and st a straight line to follow things correctly…and is there an affordable way to be a part of such a valuable internship you are working in to? I too find it great to see your live progresses. Spencer makes it feel like it’s so easy to do this because he’s an expert but it’s not. It took me a couple of attempts to create one successful niche site but I didn’t take a brandable domain so it’s hard to grow it into something bigger. 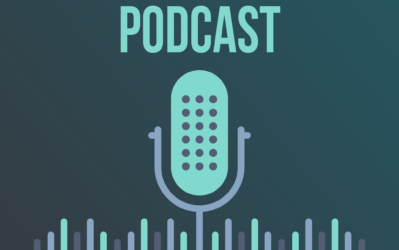 Over the last month I’ve listened to all the coaching calls you and Spencer had and I’ve decided to create an authority niche site this time. Your site is great. You’ve been doing a good job and finding people to interview is such a good idea. I think I’ll do the same on my authority niche site. Keep working hard. It’s going to pay over the long run. Making passive income from a site seems to take quite some time nowadays but I believe it’s worth the trouble! I have been following this project from the start and I have learned a lot to help me with my own project. I am glad to see that you are doing well. Fantastic job Spencer and Samara rock! No problem, you and Spencer have really helped me a lot. I am actually starting to see traffic. It’s a trickle but its better than nothing! I`ve been following this project since the start of it, but I have to admit that I was starting to lose some interest as you were not revealing it`s website name. Now I`m happy to follow it again and “copy” some things that could help me with my new blog. Thanks Dragos! Glad you’re following it again. There’s definitely a ton of valuable information being shared in NSP3. I hope you can use it to grow your new blog! This has been a very interesting series. I am surprised you revealed the site and I hope it does not create copycats. I have really enjoyed following your progress and wish you all the very best moving forward with the site and hope it brings you in a passive income soon. Thanks Lloyd! Revealing the site was always part of the deal, that way people can see exactly what Spencer is teaching and better apply it to their own sites. I also hope there are no copycats : ) Thanks for your support! This is awesome guys I am stoked for your progress, I am learning after years of trying to pull off this online stuff that it all just comes down to focus and ambition. You have to stay on the same course and keep yourself motivated. Great job Samara and thank you for sharing your journey. I’m on my third niche site at the moment, so I know exactly how you feel right now. Just keep it up and you’ll eventually be rewarded for the hard work. Congrats Samara on your site. I’m glad you stuck with it and plan to be in it for the long haul. Good luck in the future! Thanks Gavin! I’m definitely in it for the long haul! – Since I’m sure you want to make some good connections with “mommy bloggers”, I’m not sure if saying “get kickass ideas” in your newsletter popup box is the best idea since that alone can turn off a lot of readers in this niche. – The “Gifts for Teens” article seems out of place on your site. Hi Ivo, feedback is great. Thanks for that. You might be right about “kickass” turning people off, but at the same time, I’m not sure I want to water it down just to appeal to everyone. I will think about it. And maybe when I have more articles on teens the Gifts article won’t seem so out of place. Thanks again! Isn’t it an exciting feeling when you finally make your first dollar from your (new) niche website? Trust me, it will always be. About the WordPress learning curve, don’t worry, you’ll eventually get there… I say this but I’ve been using it for ages (more than 10 years now) and I’m still not that fond of it (but that’s because I’m a web developer originally). Hey Louie, the first dollar was absolutely thrilling. It’s funny how excited you can get over a dollar : ) As for WordPress, I think it’s a love-hate relationship at the moment… Thanks very much for your encouragement and support! Awesome reveal, thanks and good luck with what is a wide open niche! – The home page title is “Home – Tiny Fry”, I find it is still important to have keywords in the title, (as you have done with the article pages). Index page titles that say “home” have no SEO value at all. – I like that you’ve dived right in with the Amazon links, but not hyperlinking the images can lose clicks. Heatmaps show that after videos, images get clicked most on affiliate sites. I would recommend you link all your images to Amazon unless its a concious effort to manage your outbound linking ratio. 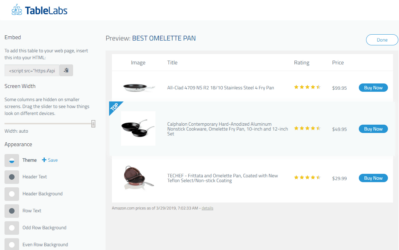 – There’s a few menu items that have not been populated with pages (ie empty categories) , this can reduce visitor confidence in a website, you might want to consider removing them (ie activities-for-babies etc) until you have some reviews in there. 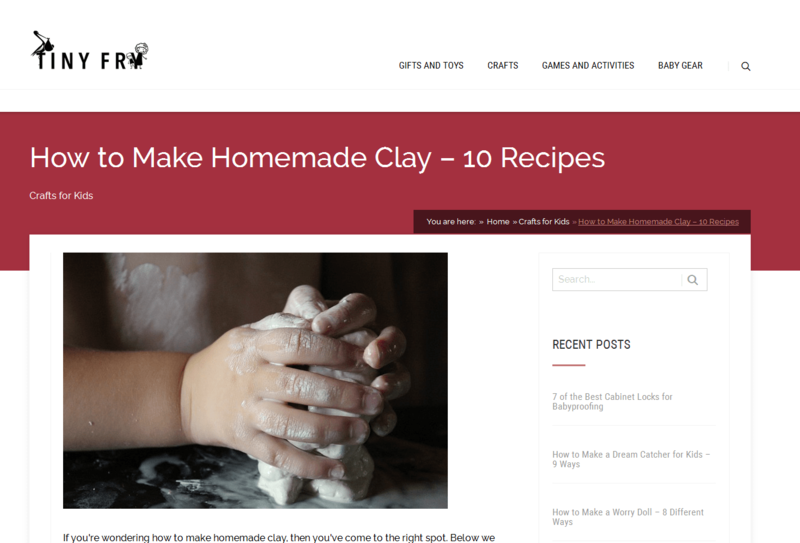 – Your pillar pages are really great, for example “how-to-make-homemade-clay”. As an experiment you might like to consider doing a similar size (1000+) quality article but without any Amazon links at all, you might be surprised at how it ranks compared to a page with more than a couple of Amazon links on it. Worth trying out. Congrats on the first benchmark of your first sale – next one “sale a day”! Hi SEO Gumshoe, thanks for all of this great advice. I obviously have limited knowledge about SEO, so this is all very useful. Thank you! On your index page you have 4 yellow box-outs above the fold, explaining your sites main content. This area is very important, as Google values this part of a page and its content higher than the lower down sections. Unfortunately Google cannot understand this section on your page as the text is actually an image. There are lots of good keywords in there, but they are only of use to people who have *already* arrived at your site, they are absolutely failing to bring you new organic visitors as Google has no clue what they are explaining. These images should be replaced as soon as possible, replacing each box with an image on the top, and explanatory *text* below. The image should have an alt tag assigned to it, another thing I think is missing from your current images. 1. More organic traffic thanks to Google’s spiders reporting back your page content more accurately. 2. Your page will load quicker for your visitors – very important! @Samara first, congrats for your site, i’m just now following about your niche site. it’s a great case study for me as a newbie too. thanks to @spencer for this site really helpful. @SEO_Gumshoe can i ask about this ;Your pillar pages are really great, for example “how-to-make-homemade-clay”. As an experiment you might like to consider doing a similar size (1000+) quality article but without any Amazon links at all, you might be surprised at how it ranks compared to a page with more than a couple of Amazon links on it. Worth trying out. do you mean for a post without any outbound link would get better rank page on google? Congratulations! As someone that has recently just started creating my own niche site I take a lot of interest and motivation from your series and progress so far. Hey Mario, that’s very kind! Thanks very much. I hope your website is taking off and that you too find a lot of success! Nice site BTW. I really like the design as well as the articles. Also, congrats on your first sale. While reading this article I noticed something. You guys mentioned overall expense of $280 on this niche site but forgot to mention the Thrive theme & content builder cost. May be Spencer hold a license for Thrive and allowed it to be use on this website but its still expense. Glad you like it Rahul! I have been working on it day and night : ) And Marco’s right, we got membership as a “gift”. The cost of using some tools like LTP and SEMrush should also be considered. For full access these would amount to 85 USD per month. Delighted for Samara and well done the NP.com team. Great niche, best wishes for it’s success!! Thank you Ray, that’s so nice of you! Congrats on the site! Very good job! TBH I wasn’t expecting anything less with your commitment and guidance! P.S: I think you forgot to include the theme in the project expenses! Hey Savvas, thanks! Thanks for following along and thanks for your support! As for the theme, we got it as a “gift”, so that’s why we didn’t include it. First of all, congrats!! The site looks really cool and professional. One thing I really liked is the extensive use of images and videos in every post. That would certainly increase the average page duration per user. By the way, the site is missing its Favicon. Would be really nice to have it. Kudos to the effort Samara has put in!! Hi Sarvesh, I’m so glad you like it! Thanks for your comments. I will look into sorting out the favicon, thanks for the tip. This was a great “reveal.” I loved the breakdown of how Samara has accomplished what she’s done so far and that it’s possible to actually make sales in as little as two months! Her site is really appealing and I LOVE that Youtube video she did…super clever and fun! Thanks for sharing. Hey Maggie, thank you so much for the kind words. I still can’t believe I’ve made some sales, it’s all very very exciting. Glad you like the YouTube video, it was a lot of fun to make! Wow! Fantastic! What a great looking site and I love the way you are monetizing with toys, cabinet locks and car seats, while providing really good content that is well organized. Also love the TinyFry Squad videos – super cute! The work you put in is obvious. Best of luck moving forward – I predict great things for tinyfry.com. If I may, I find the use of “kickass” on the opening page a bit off-putting (given your mission) and I think you ought to consider a different phrase – just the editor in me…Great job! It’s been a wonderful experience to follow your project – many thanks, Samara and Spencer! Hi Michael, thanks for all the encouragement! I have indeed been working hard : ) You’re probably right about the use of “kickass”. I have already changed it, thanks for pointing it out. And thanks for following the project, I hope you’re also working on your own site! Awesome work so far! 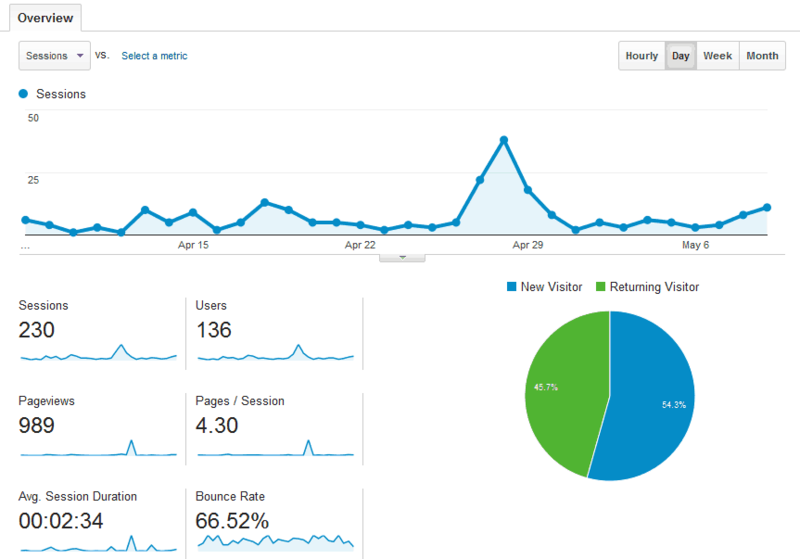 Really happy that your site is starting to gain traction. I’m just wondering where you managed to get your 10 links from? Not the specific URL’s, but if they were from directories, blog comments, guest posts, etc. Hi Jamie! Thanks for your support!! I got those links mainly from directories and blog comments, although right now I’m working on some guest posts. Spencer goes over it in the video if you want to see it in more detail. Thanks for following the project! I see that Samara’s domain shows up as being in existence since September 23, 2009. 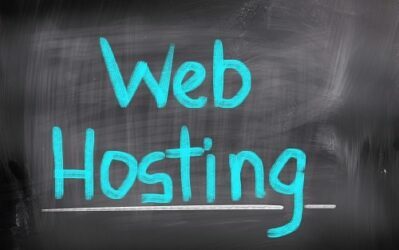 What made you decide to use a pre-existing domain? I thought in the past you were not very high on doing that. Did something change? Are you doing this on most of your new sites? Hey Jagger, we actually didn’t know the domain had been previously owned until just now when you mentioned it! The fact that the domain was previously owned was by pure happenstance. I don’t seek out expired domains at all. The TinyFry.com url has an extra %21 at the end that wouldn’t let me go directly to the site. She might be losing some traffic from that. I’m not seeing that on my end, anyone else? I love all you guys. Looked at the site it doesn’t have the %21 in the url but perhaps Brittney saw it. Thank you for all the updates. Btw site looks awesome. Great job!!! I’ve been following your coaching classes, and I must say you’ve made it. All The Best for the future and again Congratulations for the baby, Keep Blogging! This is inspiring stuff. It shows when you sweat it out combined with perseverance and dedication, you can achieve the goal. That feeling of earning 1 dollar (even if it is very small in value) is as good as anything you would experience in your life. Hey Mohammad, I agree—the feeling of earning just 1 dollar is pretty darn awesome. Thanks for following the project! I love the website! Well done and good luck! I just wanted to know where you get your stock images from as they look amazing? Thank you Tia! Glad you like the stock images. I got most of them on Pixabay, they have a very big selection of free photos. Thanks to Spencer for sharing your knowledge but especially to Samara for putting herself ‘out there’ and learning the Internet marketing ropes in public! You mentioned about settling on an article style for your blog posts. If using Thrive Content Builder, make use of the Content Templates, if you haven’t discovered already. It will save you a ton of time. Good luck with your future developments. Congrats Samara on your achievements so far! I created my niche site around the same time that you did, and Ive been following your journey all along and we have had similar successes, which is very encouraging. Just a question about the Amazon sale you made, was it for a product you linked to or something else? Ive made a few sales so far but not on any products featured on my site (and only 1 was related to my niche). Not that it matters because money is money and I’ll take any commission! But Im interested to know whether this is a common occurrence in the “early days”, and whether it’s anything to worry about. I love your Blog. The theme is stunning . I know it is one of thrives masterpieces. However, did you hire someone to customize it ? Or was this the default look after you installed the theme? I am planing to give my blog a face-lift and maybe a nose job . Any recommendation would be great. Congrats! Great looking site and your sales too :-). I have a question, regarding content, would you continue outsourcing your content or you plan to write by yourself? Where did you hire your writers? Hey Rocky, thanks for your support! I plan on writing my own content for the time being. I hired writers on Freelancer and, in retrospect, I totally skimped on the price. Turns out you get what you pay for : ) Glad you liked the video! I saw the ranking of the keywords are not at the first page, aren’t these keywords low competition or cauz samara didn’t do any backlinks? I’m wondering if a low competition keyword can be ranked without links. Do you have any plans about backlinks? I have read a lot of article about backlinking, someone say it a must, but someone say to do naturally. Is the backlink mater for SERP nowadays? or better withour backlink and let the web got backlink naturally? one more question? i have make a lot of article in low competition keyword, but just 20% going to first page, so i just write and write again and wish the my new article will be ranked better, i never concern about one keyword, when i failed, i just try another keyword. Do you have any suggestion for me? Good job Samara, and good luck ! While I love being called a “mini guru”, I suspect you’re being over-generous : ) I definitely know more than nothing now, but there’s still a long way to go and so much more to learn! I’ve been quietly following this and love this project. Awesome job thus far, making $15 may not seem like much, but straight out the gate that’s pretty darn good. which have all been fixed already. Samara was a worthy first pick in this contest – she’s ready to listen to advice and keen to sponge up all the information she’s given. I’d love to hear back from time to time to see what progress the site is making! Hey Andrew, thanks for your kind words! I am definitely interested in feedback. It’s super helpful to hear what people think and I value others’ suggestions and opinions. It’s all about the learning experience! I have a question about sandbox what do you expect after 6 months skyrocket rise on traffic or slowly growing, I have a site that reached the 6 months but I see no progress what this mean I’m confused whether to continue working on it or not. by the way Im ranking some keyword about 50 on google webmaster tool but not the first page is it a positive sign? I have a question about sandbox what do you expect after 6 months skyrocket rise on traffic or slowly growing, I have a site that reached the 6 months but I see no progress what this mean I’m confused whether to continue working on it or not. Congratulations. Create niche blog is an art that you know a lot . Thanks for sharing. I was wondering why you decided to have so much affiliate content on your site at such an early stage in the content launch process? As I recall, Spencer specified to have a 1/3 ratio with affiliate to social content. I was just wondering if you know if it’s okay to post a lot of affiliate content as long as you’re providing people with value outside of your monetized posts? I noticed you had about a 50/50 ratio with all the content you have posted now. 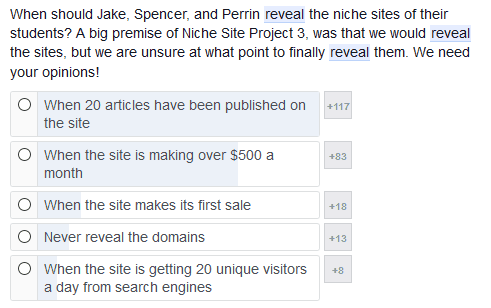 Obviously we’d all love to monetize our site as much as we can, but I was just curious if you’re concerned with the site getting flagged by google at all based on what Spencer recommended early on in the project, and what happend to Perrin’s website last niche project? Or, should more people explore posting plenty of affiliate content with a solid mix of social content? Congratulation.. I am so excited to see the site starts earning. I’ve been following you guys from very beginning. Keep up the great work please. You inspire me alot. Thanks LH1102! I’m glad you’re following along, and I hope you’re also building your own site! Congratulation. I am so excited to see the site start earning. To be honest I learn everything about blog here, I’ve been following Spencer from Niche site project 1. So inspired to see your success Samara. It’s been great seeing the progress of all the students. I’m trying to catch up without spending two weeks just listening to podcasts! It’s actually inspired me to revisit an old website that’s been sitting for a few years. I’m hoping to revive it and turn it into something bigger with the keyword research that I’ve done. Hey Jeanette, thanks for following the project. I’m glad you’ve been inspired to take action on an old site, good luck with it!. I can’t believe you don’t like keyword research, that’s my favorite part! Wow is all I can say. Great information! So much to take in. You answered a ton of my questions just in this one article. Thanks! Glad to hear it Hanuman! Great work so far in the project, it’s been very educational to follow along with the current niche site projects. I was just wondering why you guys have so much affiliate content on the site? Are you concerned with the ratio and getting flagged by google, or are you just going to make more social content as the coming weeks start to go by to even out your social to affiliate content ratio? Congratulations Samara! The first $ is the sweetest and Am just looking forward when you hit the $500 and surpass it! Wow! Congrats on that site. Really great progress, nothing like that feeling of the first dollar right? Congratulations on the baby! Look forward to following you in the future, keep us updated! That’s pretty impressive Samara. Good going with the site I would have look at the site and figure out what I can learn from the strategies you have used. Anyways congrats keep going. This nice work so far. You surprise us about your site is starting working great. I think a most important is links where i do not know how to 1000links to a site. I hope you can share with altogether. Thanks in advance for a nice tutorial on this nice website. Can you refer any one good theme for affiliate site. Does anyone here knows if Pinterest is a weak type of site like: article directories, forums, Yahoo Answers, other Q&A sites, social sites, or other user generated type sites? Wow, every new coaching call is worth more than gold, Am also following and i have made 20 bucks from my niche site too. All images of your site are all super quality and very relevant, i struggle with getting clear and relevant pictures, will you please share how you get this images? Congratulations on your current success. I am doing some keyword research and seeing some doppelganger sites which are ranking and collecting great traffic according to SEMRush, now when I look at their links, I have noticed that several are using PBN and or getting un-related links which I can’t even find on the reffering website basically spammy links. Another thing I have noticed is that there are a lot of NicheSites in my niche do you think if there is too much competition I should just leave it or should I see that as a sign that there is plenty of demand for the niche I am targetting? Thanks for all the content Spencer! Hi Spencer, is longtailpro needed after I have written down all the keywords for my chosen niche with a search volume of 200 and under? I use it a lot to check competition over time, when I write new articles (I’m always creating new sites)…and you can check where you rank. I’ve been following along with your progress, and it’s so awesome to finally see the finished product! (or probably the start of many versions of the finished product, I imagine!) I’ve signed up for your newsletter and Twitter feed and can’t wait to see how you grow this! And thank you, Spencer for allowing all of us to get a little peek into how you approach these niche sites! That is a pretty smart looking site. I especially liked the article about the paper mache fish. I even left a comment there as I see, sadly, no one else has so far. Soon there will be plenty though I hope. Thanks for the all the great advice! I am going each step slowly and I am now starting to get my website just how I like it, it is taking a lot of time ( I am wordpress newbie ) but I am pleased with the results so far. It feels like it needs to be a marathon not a sprint when it comes to creating a niche site with detailed content.